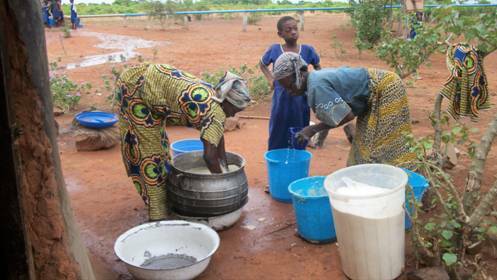 Bumboazio is a non-electrified community a few kilometers from Langbinsi in the East Mamprusi District of northern Ghana. 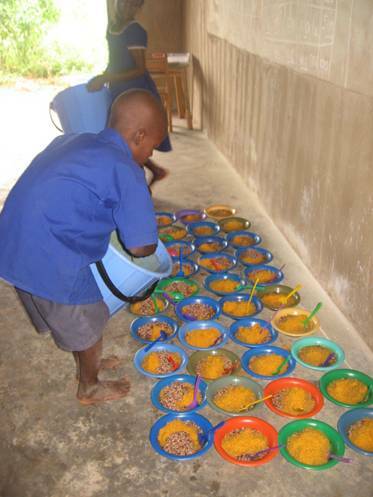 This community has a school that was been founded and is managed by PAMBE Ghana, a non-profit organization (NGO). b.) rehabilitate the existing DC system for the Lower Elementary Block. This was made up of twelve 50-watt panels (600Watt peak) system designed to generate about 3,910KWh in a day, depending on the sun. This typically was to run 10 laptop computers with a one-day autonomy since it is a school. It also included ten 9-watt bulbs in the computer lab as well as security lighting around the lab. The school also had three separate 100-Watt DC (Direct Current) for lighting in the class rooms and outside for security. RE-DESIGNING, UPGRADING, PROCURING AND INSTALLING A 3.2KWP SOLAR SYSTEM OF THE SCHOOL COMPUTER LABORATORY, LIBRARY AND UPPER ELEMENTARY BLOCK. The new system is design to provide power for up to two projectors, 30 laptop computers, 30 AC (Alternating Current) lighting for the computer lab, library, security lights and for all the classrooms on the Upper Elementary Classroom Block. The system is made up of 20 pieces of 50watt peak (total 1kWp) panels and 8 pieces of 275watt peak (total 2.2kWp) of Solar panels. Total installed capacity is 3.2kWP (3200 kilo watt peak). The solar panels are mounted on the roof of the building, at the same tilt angle and orientation as the building facing south. 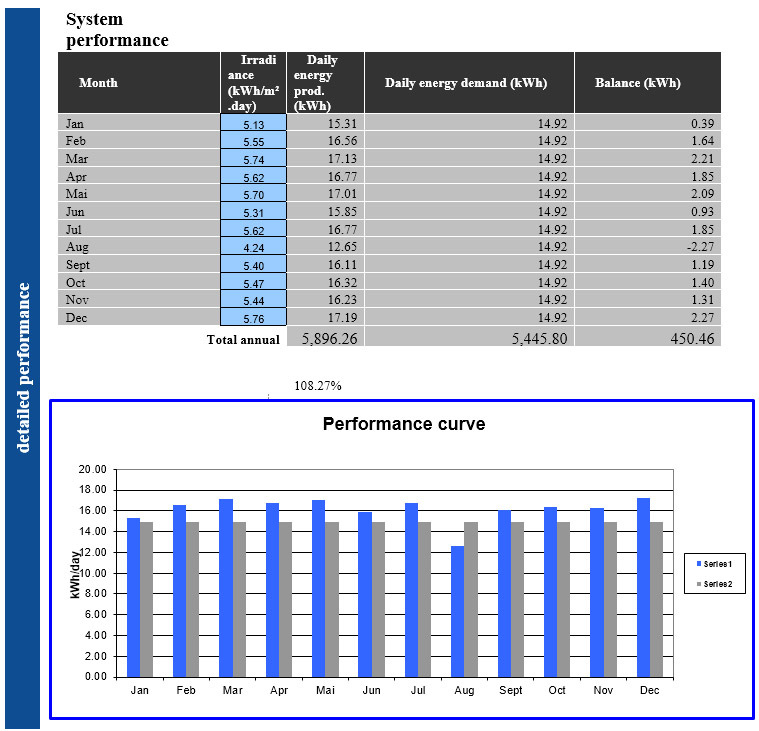 The 20 pieces of the 50watt peak (1kWp) is connected to a controller and six of the 275watt Peak (1.65kWp) is connected to the Growatt 3kva inverter charger Controller 1, and the remaining two (2) 275watt peak (0.55watt peak) is also connected to Controller 2 above. This forms a 3.2kWp generator which can produce 19200Kwh of power a day considering maximum sunshine of 6 hours a day. 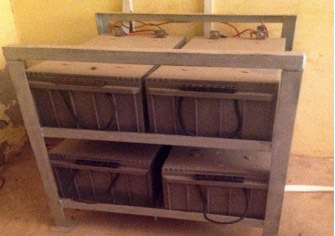 The battery bank is made up of four number 200ah deep cycle batteries connected in series to form a battery bank. This number of batteries was arrived at considering the fact that most of the load (about 90%) will be run during the day when the sun is still available. 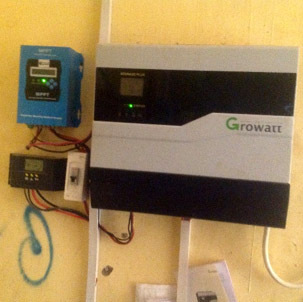 The selected inverter is hybrid, Growatt 3kVA storage plus. This allows the client or customer to select which power source should be used first, in terms of Battery, Solar or Grid (where Grid is available). The inverter is programmed for Solar panel/energy to supply power to the load is first priority, and if the energy from the solar is not sufficient to power all connected load, battery energy will supply power to the load at the same time with the solar panels. The expected load to connect to the system is 14920wh in a day. Table above are details of the load. In comparison with other types of electrical power plants, PV plants require less maintenance. The inverters are the most critical components and they tend to be the cause of most major outages in a PV plant. However, inverter technology has improved significantly over the past few years and typical failures, if they occur, often happen during commissioning or very early in the life of the plant and are thus within the warranty period. Besides scheduled maintenance for inverters, the other activities include periodic washing of the modules and unscheduled maintenance activities, which require minimal staffing. There are no emissions associated with solar PV systems during operations. Eight pieces of 255-watt solar PV panels and eight additional 50-watt solar PV panels were procured and added to the existing twelve 50-watt panels. The new system produces about 1,840Wh a day, depending on the availability of the SUN. 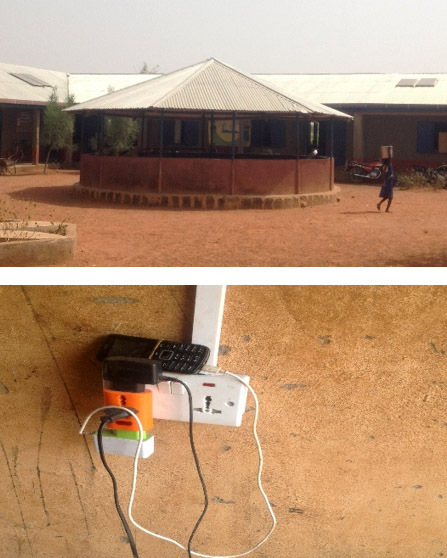 Each classroom is provided with a socket outlet (15 points in all) to enable the use of a laptop in the classrooms. The three separate 100-Watt solar panels were brought together to supply 20 DC (Direct Current) lighting points for the Lower Elementary Classroom Block. The system was successfully installed and Is performing within expectations. 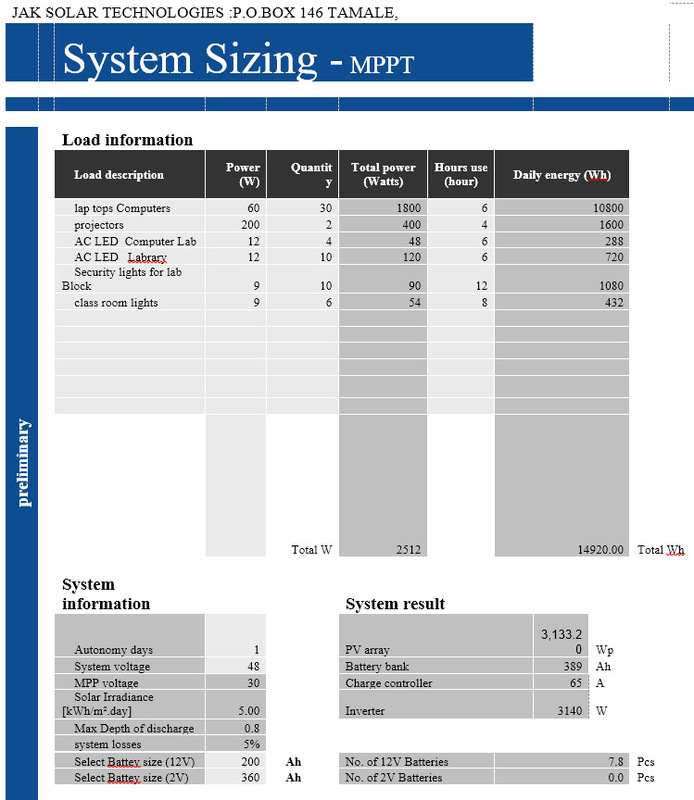 As time goes by, Jak Solar Tech is willing to assist with further studies and analysis of the system. 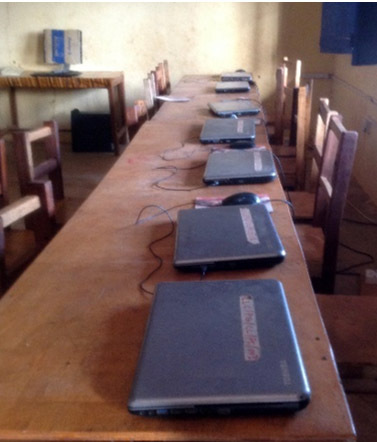 We acquired 20 new laptop computers (HP), 20 computer mouses and one complete desktop computer to be used mainly as a teaching aid. 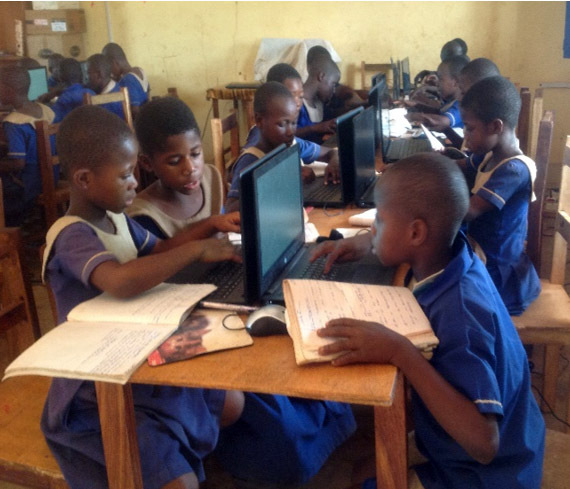 I did some research on laptops versus desktops for a computer laboratory, given that the GES ICT curriculum and assessments are based on the desktop. Power consumption was the deciding factor. A desktop needs 2-3 times the amount needed for a laptop! They also need to be plugged in at all times in order to work. Laptop computers are obviously, more suitable for our solar-powered computer lab. We now have 26 laptop computers and one desktop in the computer lab. We will donate one of the Toshiba laptops to Unity JHS. With this number of computers, the whole class of 35-40 students can be together for a lesson! We also purchased two important pieces of equipment; a Canon photocopier/printer with 4 toners, and an Optiva HIFI Speaker System, with two microphones. 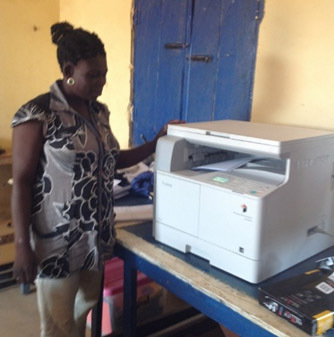 The photocopier/printer, though much more costly than a printer, it is much more economical for printing and photocopying in the long run. It is easy to operate and requires very little maintenance, and toners are much cheaper than cartridges for photocopying. Thus, it is more suited for heavy-duty copying in school. The only downside is that it only makes black and white copies. Luckily, we have a 3-in-all printer for color printing, scanning and copying, if need be. Optiva HIFI Speaker System is a Public Address System (PAS) we have needed for a long time in the school. Over the years, we have had to hire an often ineffective one from the community for events in the school. Our new PAS arrived in time to be baptized on our Independence Day celebration on March 6th, 2019! Additionally, we got 20 chairs for our well-deserving teachers instead of a new projector and screen to replace our very old projector. We are very grateful for the support we continue to receive from the Milburns Charitable Fund at the Oklahoma City Community Foundation. Thank you! Want to try new international foods, explore a Fair Trade Global Market and spend an evening outside in lovely gardens? 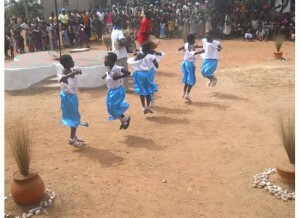 Listen to music, dance and learn about a group of Oklahomans who are supporting a school in Ghana? Then don’t miss the second annual PAMBE Ghana Fest, 6-9 p.m. Friday, May 8, at St. Paul’s Cathedral, NW 7 and Robinson. Admission will be $8 a person, $15 a couple and free for children 12 and under. Funds from the event will support the La’Angum Learning Center, an innovative, Montessori-based school in northern Ghana. 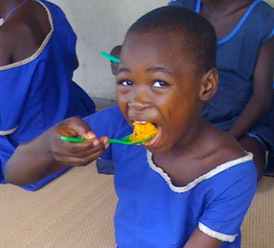 PAMBE Ghana is a partnership between local communities in northern Ghana and supporters in Oklahoma. Together they’ve built the La’Angum Learning Center, a new model for education in Ghana — new because it first teaches children in the language they speak and in a child-centered way. 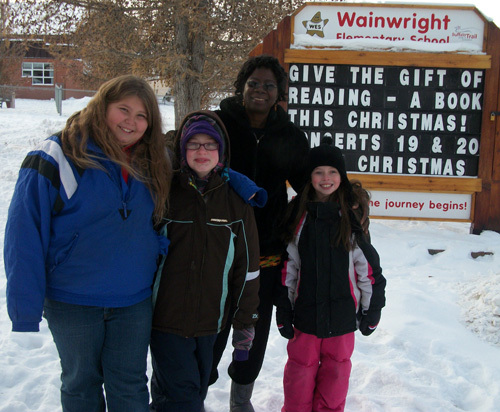 The school currently serves pre-kindergarten through fifth grade, but hopes to expand. “The Cathedral is proud to support PAMBE Ghana,” The Very Rev. Justin Lindstrom, dean of St. Paul’s Cathedral and a PAMBE board member, said. “We are so glad to be hosting the PAMBE Ghana Fest again this year and hope many will come out to enjoy our beautiful gardens, as well as the great food and entertainment." Bring folding chairs or blankets to enjoy entertainment on the grass. In the event of rain, the Fest will be moved indoors. Listen to Alice's conversation with Suzette Grillot on World Views, airing Friday, January 24 between 4 and 4:30 p.m., and again between 6:30 and 7 p.m. The segment will air again Saturday, January 25, between 6 and 6:30 a.m.
Click the KGOU image below to stream Alice's interview, and read the full article by Brian Hardzinski and Suzette Grillot! 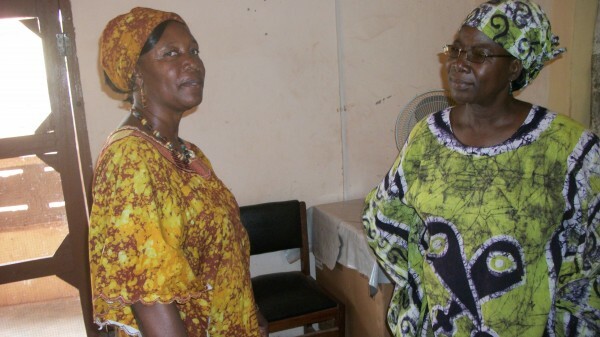 Mrs. Glady Lariba Mahama, right, Alice Azumi Iddi-Gubbels, left. Mrs. Glady Lariba Mahama is one of the AC members of PAMBE Ghana, who has been doing very well and working very actively for P.G. She recently paid a courtesy visit to the PAMBE Ghana office, and gladly donated a bag of corn for the lunch of the 131 children of La'Angum Learning Center. Thank you, Mrs. Glady Lariba Mahama! Your generosity is greatly appreciated! We ran out of water completely from the rainwater harvesting cisterns. 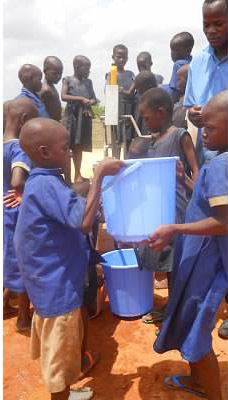 The 3rd graders and older children from other grades began carrying water to school. The problem was discussed at a PTA and several options were considered for the immediate relief, including asking mothers to assume the task as before. However, some women spoke of their already heavy workload and it was decided parents pay GHS 1.00 per child. I agreed that PAMBE Ghana will supplement their contributions to pay for 10 trips of carting water at GHS 25.00 per trip. 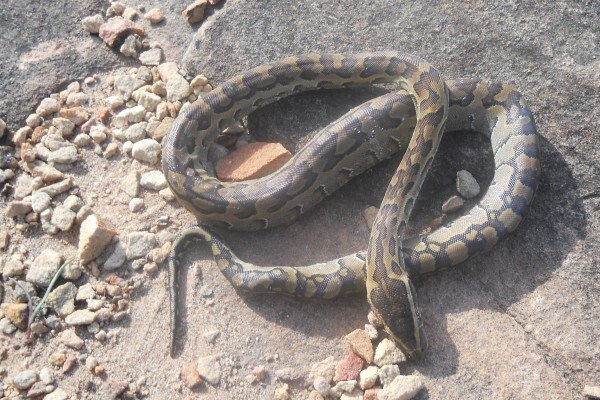 The Langbinsi Presbyterian Agricultural Station provides this service. The water is dirty, and unless filtered, is not safe for drinking. But dirty water also quenches fire! This has really put water in focus even more than before. I submitted an application to the district assembly, and spoke with the water and sanitation team about a feasibility study for a borehole. Luckily for us, a team of water technicians, including hydro geologists, was engaged to do feasibility studies for drilling water wells in the district. With the help of Mr. Alhassan from the district water and sanitation team, I was able to negotiate a two-day study to find if there’s appreciable ground water near the school to merit the cost of drilling a well. They first gathered information on an existing drilled well near the village about a mile and half from the school, as a baseline. They were able to find two possible sites near LLC, one of which had slightly higher potential. I am considering three options to address the water problem. The ultimate goal is to have a permanent source of clean potable water in the school. a) Drill a well (borehole) close to LLC and mechanize it, after undertaking a “pump test” which will include the quality of the water and yield/min. Pump the water (with a solar water pump) to an overhead tank. b) Lay pipes from an existing well (one and half miles away) to LLC and mechanize as above. c) Build another rainwater harvesting system and continue to expand as the student population increases. According to the feasibility studies just done, option a) will be more reliable and cheaper eventually. On March 6, 1957, 56 years ago, Ghana became the first African nation to gain independence from a colonial power (the United Kingdom). Modern Ghana is a combination of the former British Togoland (the Volta Region, along the east) and of the colony known as the Gold Coast. The word Ghana means Warrior King, and is derived from the ancient Ghana Empire. Modern Ghana’s motto is “Freedom and Justice." The national anthem is “God Bless Our Homeland in Ghana," and is sung before the National Pledge of Ghana. As in the United States, Independence Day is Ghana is marked by parades and fireworks. National Pledge of Ghana I promise on my honor to be faithful and loyal to Ghana my motherland.